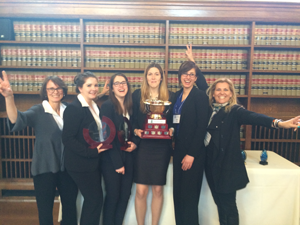 Martha McCarthy & Company LLP would like to congratulate the University of Toronto Walsh Family Law Mooters on their spectacular results!Brenna Staats, Jesse Elders, Paloma van Groll and Colleen McKeown represented UofT, with all six Ontario law schools competing. The mooters were unflappable in the face of tough questioning on a very complex problem. 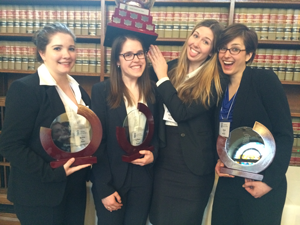 When all was said and done, the UofT team nearly swept the competition, winning Best Team, Best Factum for the Respondent (team of Paloma van Groll and Colleen McKeown), and 2nd Place Oralist for Colleen McKeown. In the face of a difficult problem, and a brand-new moot for the school, the team showed its skill and versatility in pulling off an unparalleled performance. The team is truly indebted to its all-star student coaches: Laura Cardiff, Jordan Katz, and Hani Migally; and to Carol Rogerson for her tireless faculty support.Martha McCarthy and Sarah Young of Martha McCarthy & Co. LLP had the pleasure of assisting with coaching the team and are so proud of the team and their success.